Susanna Rowson wrote the first American bestseller, Charlotte Temple. She was born in Portsmouth, England, to Lieutenant William Haswell of the Royal Navy and his first wife Susanna Musgrave, who died of childbirth complications a few days later. Her father was posted to Boston, Massachusetts, where he remarried and started a second family. He brought Susanna to live with them in Nantasket, now Hull. After leaving the navy, her father remained a British loyalist, and at the outbreak of the American Revolutionary War was placed under house arrest and all his property was confiscated. In 1778, the family was deported to England, where they settled near Kingston upon Hull. Susanna went to work as a governess, and with the patronage of the Duchess of Devonshire, published her first novel, Victoria (1786). That same year, she married William Rowson, a hardware merchant from a theatrical family. In 1791, she published the novel Charlotte Temple (first called Charlotte, A Tale of Truth), which became a bestseller in the USA when it appeared there in 1794, and continued to be popular in the 19th century. After her husband's hardware business failed, the couple and Susanna's orphaned younger sister Charlotte turned to acting to support themselves. Susanna joined the Theatre Royal in Edinburgh. In 1793, the three were recruited for the Chestnut Street Theater in Philadelphia. Over the next three years, while performing some 57 roles on stage, Susanna wrote a novel, an opera, a musical about the Whiskey Rebellion called The Volunteers, and several songs for the company. In 1796, the Rowson trio relocated to Boston, where Susanna founded one of the nation's first high schools for girls, Mrs. Rowson's Academy for Young Ladies. She continued writing, producing textbooks and a dictionary for her school as well as further novels and plays. She was a columnist for The Boston Weekly Magazine and became its first female editor in 1802. She wrote a sequel to Charlotte Temple, entitled Charlotte’s Daughter or The Three Orphans (also called Lucy Temple), which was published posthumously in 1828. Susanna Rowson is currently considered a "single author." If one or more works are by a distinct, homonymous authors, go ahead and split the author. 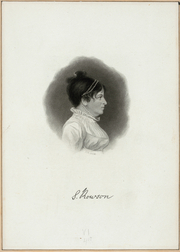 Susanna Rowson is composed of 7 names. You can examine and separate out names.